THR Marine is able to supply anchor capstans, mooring capstans and a combination of both. THR is able to supply an anchor capstan for a wide variety of anchor chain. Anchor capstans can be delivered with electric as well as hydraulic drives. The chain wheel can be operated by means of a hand wheel what is mounted on the topside of the capstan. As an option also a warping head can be delivered in combination with this anchor capstan. Anchor capstans are equipped with a horizontal band brake with the brake fitted to the gearbox. The THR electric or hydraulic capstans are characterized by their compact shape. The warping head is built on top of a round pedestal. Either the electric or hydraulic system is built in this pedestal, so the components will be under deck. 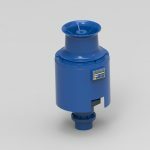 Within a certain range the operation height of the capstan can be adjusted to meet the practical requirements. The electric capstan can be delivered with a one, two or three speed electro motor. The advantage of the stepless control of the warping head can be achieved with hydraulic or frequency driven capstans. THR can delivered Capstans according to DIN 84154. Besides the standard anchor and mooring capstans THR can also supply capstans that have gears and electro motor that are fully incorporated in the warping head of the capstan. 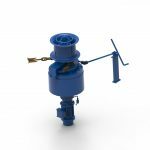 This way of building results in very compact shaped capstans that can be installed completely on deck. THR Marine is also able to deliver anchor capstans in high polished stainless steel yacht execution.